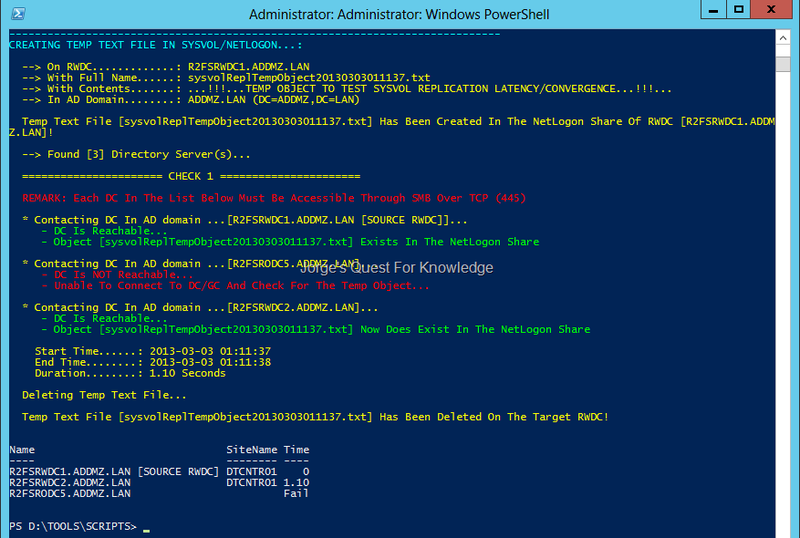 (2013-03-03) Testing SYSVOL Replication Latency/Convergence Through PowerShell « Jorge's Quest For Knowledge! A few days ago a Microsoft PFE, that probable is using the script above, contacted me asking if I also had a version that could be used to test the latency/convergence of the SYSVOL replication. It was not that difficult to change the AD version in a way to check the SYSVOL replication. You might think I now have one script that does both AD and SYSVOL, but au contraire, there are two scripts. The one above does AD, and the one below does SYSVOL. The behavior/logic for the SYSVOL version of the script is very similar to the AD version of the script. To use the script just copy the contents of the table below and put that in a script that could be called "Check-SYSVOL-Replication-Latency-Convergence.ps1", but this is of course not mandatory. In the explanations and examples I will use this name. 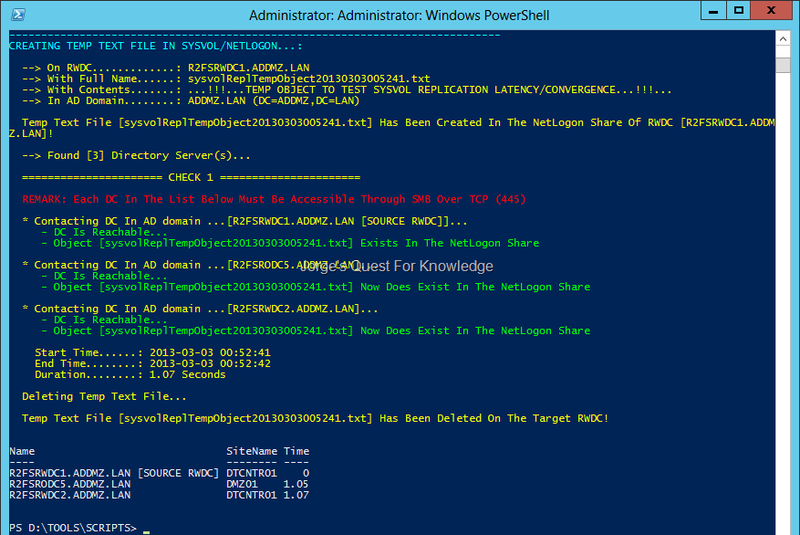 Note that this script is not signed in any way by me, so you might need to adjust the PowerShell Execution Policy of the server where you want to execute this script. It is not possible to pass credentials through the script, so the account you are using to execute the script should have the correct permissions to create (and delete afterwards) the temporary text file in the NETLOGON folder or you should execute the script from a PowerShell console window that was started with credentials that do have the correct permissions. In addition, the server where this script is executed must be able to access every DC (RWDC and RODC) in the same AD domain through SMB (port 445). So if your network is not fully routed or you have firewalls deployed between directory servers, and those directory servers are therefore not reachable, they will be marked as not reachable. This prevents the script from trying to contact the directory servers while it is not possible. Last but not least, I just tested this script in a single AD domain AD forest with a few DCs (RWDCs and RODCs). So I do not know how well this is going to perform in an environment with a lot of DCs. If you are going to use this script, the only thing I would like to ask you is to give me feedback about it and your experiences. Thanks! REMARK: This script just takes the SYSVOL into account, which is the default domain DFS namespace. However, the script could be adjusted to support ANY domain DFS namespace! The script supports both NTFRS and DFSR as the replication mechanism. After the script is started, it will give you information about the DCs in the same AD domain as the server where the script is being executed on. As the default AD domain, it will use the AD domain of the server the script is being executed on. $SearcherNTFRS.Filter = "(&(objectClass=nTFRSSubscriber)(name=Domain System Volume (SYSVOL share)))"
Write-Host "SYSVOL Replication Mechanism Being Used...: NTFRS"
$scriptsUNCPathOnSourcingRWDC = "\\" + $SourceRWDCInADDomainFQDN + "\" + $($sysvolRootPathOnSourcingRWDC.Replace(":","$")) + "\Scripts"
$tempObjectName = "sysvolReplTempObject" + (Get-Date -f yyyyMMddHHmmss) + ".txt"
If a DC is marked green, then the temporary text file has replicated to it and the script found the temporary text file. If a DC is marked red, then the temporary text file has not yet replicated to it OR the DC has been marked as unreachable. When finished it shows the start time, the end time and the duration of time before the temporary text file reached all directory servers. It also removed the temporary text file again to keep stuff clean. This is a W2K12 AD domain that uses DFS-R as the SYSVOL replication mechanism. In this case NOT ALL directory servers are reachable. The RODC is separated by a firewall from the RWDCs. The RODC can communicate with both RWDCs, The RWDCs however cannot with the RODC, except for the RPC Endpoint Mapper port and the statically configured AD replication port for change notifications. For DCs that are not reachable, the domain name and the site name of the DC might not always be specified in the table. The script uses the AD domain the server is a part of where the script is executed. I chose for the script to find an RWDC as the target RWDC to write the temp object to. NOTE the reachability of the RODC! However, the script is not able to check that because the firewall does not allow communications to the RODC! Because the RODC is not reachable, it is marked as “Fail” in the timing. 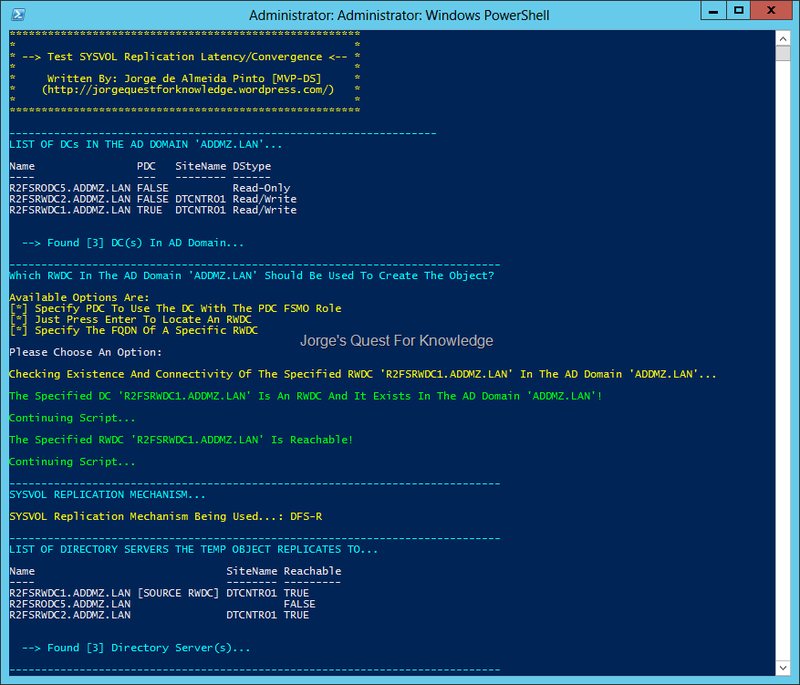 This entry was posted on 2013-03-03 at 01:23	and is filed under Active Directory Domain Services (ADDS), PowerShell, Replication, SYSVOL, Tooling/Scripting. You can follow any responses to this entry through the RSS 2.0 feed. You can leave a response, or trackback from your own site. Script errors, continues and I believe goes into an infinite loop (at least in my case). The temp object is never actually created even though it says it exists on in NetLogon of one of the DCs. Out-File : The network name cannot be found. Revome-Item : Canot find path ‘\\FQDNDC\\Scripts\…. Give me some time to look at it. I’ll get back to you ASAP! FYI, the Check AD Replication script is an awesome tool.